Rubik PMS App is the most modern application built for Real Estate Companies who Sell, Lease & Manage Facilities. It is a game changer! It brings a new level of transparency and collaboration that is critical to transform property companies and deliver new digital customer experiences. 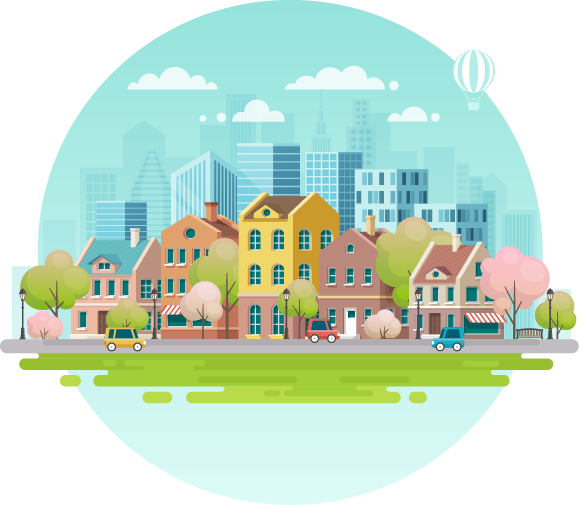 Built on cloud platform used by 40,000+ companies, the app handles the complete spectrum of property management starting from Project/Communities Setup, Towers/Villas/RV's/Commercial Properties, Units & Prices, Sales & Lease Contracting, Daily Facility Management. This coupled with integrated financials and business intelligence provides one complete solution for all your departments and people. In simple words one single system to manage all your Real Estate Operations. Plan. Organise. Sell & Track Your Properties. In One Visual, Collaborative Application. Helps you easily create all your real estate projects, track leads, customer relationships, sales pipeline, and tasks in one place so you can focus on closing the deals and not other things around. Create a multilevel towers and unit structure and set pricing by unit types and area etc. Add assets to units, upload pictures, floor maps, add notes related to a specific unit or property directly. Save time by creating Sales & Lease contracts on your branded templates with all the contract data filled in automatically, set up various pricing rules, add multiple services to one contract in one place. 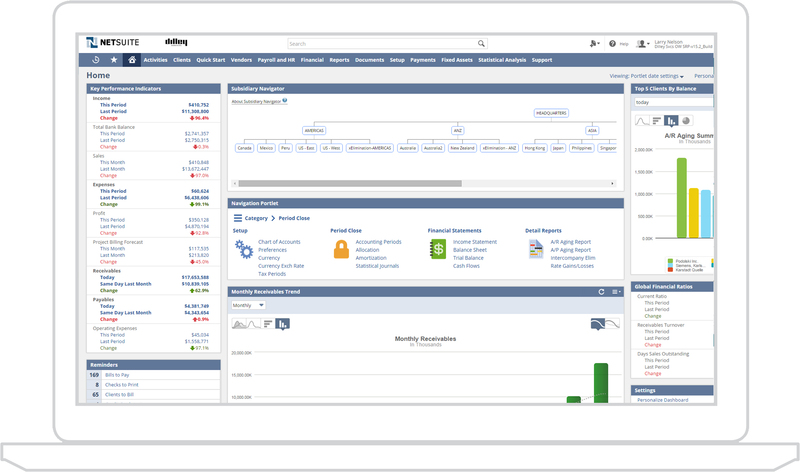 Seamless accounting lets you track payments visually, take action, remain organized and stay in control of the complex payment schedules. It handles the complete accounting, revenue for developers. Powerful, User Friendly & Fully Customisable. For years, property developers like you have been forced to use excel sheets, offline complex systems to manage their real estate projects. Those days are over. With Rubik PMS, you will get 360 degree view to manage multiple properties, units, departments and teams. Work with a property management software that adjusts to your business, rather than one that forces you to adjust. Our new interface utilises the latest technology to deliver the clean, sleek, streamlined experience users have come to expect from latest web technologies. We know your business is always on the go, so we optimised the entire interface to be fully functional and easy to learn. Why is Rubik PMS App Unique ? 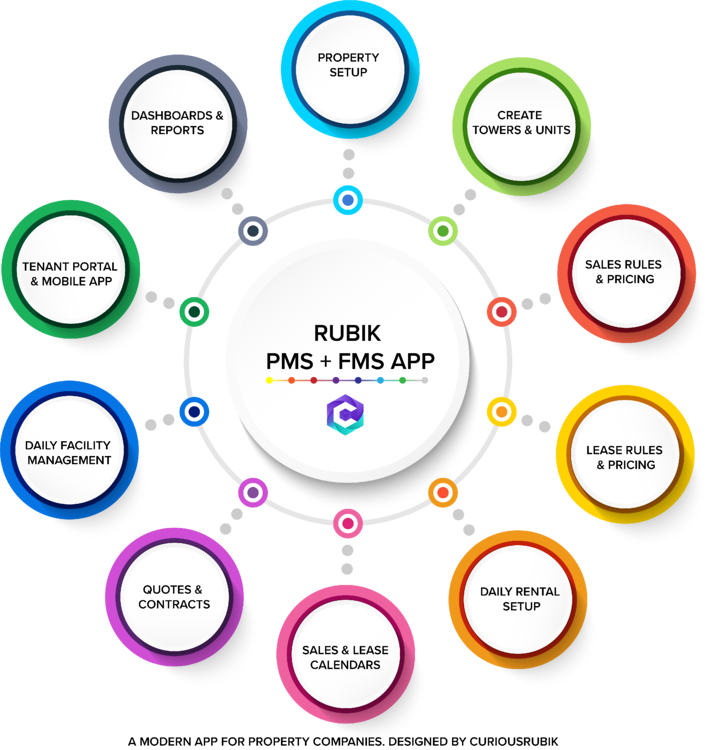 Rubik PMS App is built from the ground up to be an enterprise class property management software coupled with the user experience, functionality & flexibility that you’ve never experienced with any other software in the market. We set out to build the most intuitive yet powerful platform for property management companies. Most importantly, you’ll find the most advanced customisation to make it easier for you to­ tailor the app to your business, not the other way around. Once you define your property, you can setup different hierarchies such as property group, number of towers & floors per tower, villa and individual units etc. You can define multiple unit configurations as you need such 2 or 3 or 3.5 etc Bed Rooms. Define multiple pricing items to be included in Sales Quotations, Contracts and add multi currency pricing, payment methods by project. Capture Leads, Generate Quotes / Contracts & Much More. Leads are the lifeblood of any real estate company — and in reality, of any company. You should organise your sales process, win more deals, and create happy customers. The app allows you to capture the leads from Websites, Landing Pages, Property Sales Sites, Social channels and other sources to get an unified view of opportunities. This helps you to deliver outstanding customer experiences by breaking barriers between marketing, sales, and support teams so that everyone views the same unified data. Streamline your quote and order process with a fully integrated quote-to-order, cash and fulfilment solution. Create standard operating procedures to guide your process. Your sales reps or community managers can generate Property/Unit specific quotes to their prospects on the fly. 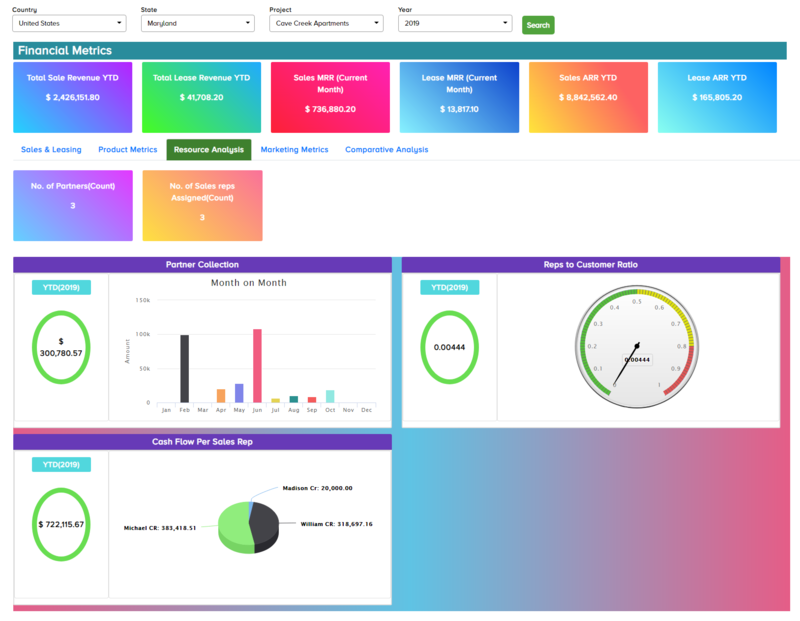 Create conditional logics and required steps to ensure the team will stay on track.Automate repetitive manual work and view all interactions and deal information in one location. Stay up to date with every deal and watch them flow through each stage. Screening, Payment Plans & Much More.. Completing a Property Sale is never as easy as just getting a customer to agree to commit. Along with the surface details of any sale, there are hundreds of smaller tasks such as customer screening, payment plans, legal documents, approvals etc that must be completed in order for everything to function properly. 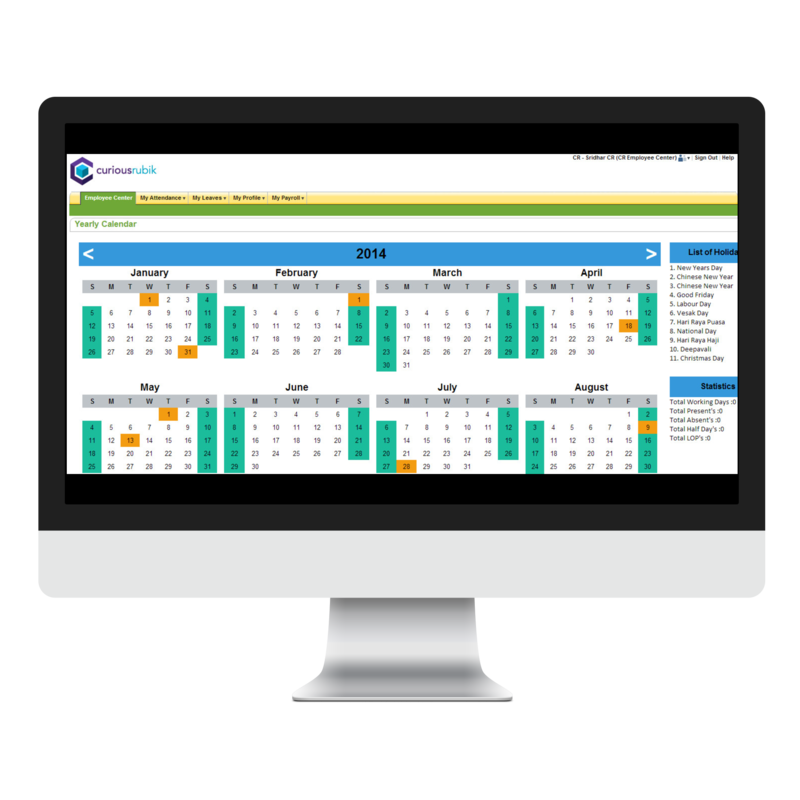 Create customisable sales processes that fit for your property/company. Automate more tedious tasks and never let a deal or lead go without a follow-up to always stay on top of your sales game. This provides holistic view of all the steps involved in the sales process and guides your team to perform their task in a single view. The app offers powerful property lease management solution that centralises you lease data across all your properties and units. You will have a single and streamlined view of your leased and vacant units. It gives all tools to manage lease related aspects of your properties. You can generate lease quotes, renewals, terminations etc and streamline process such as tenant screening and accounting operations. You can accept rental applications from your customer portals, and process any related fees. Stop digging for the answers you need across multiple systems! 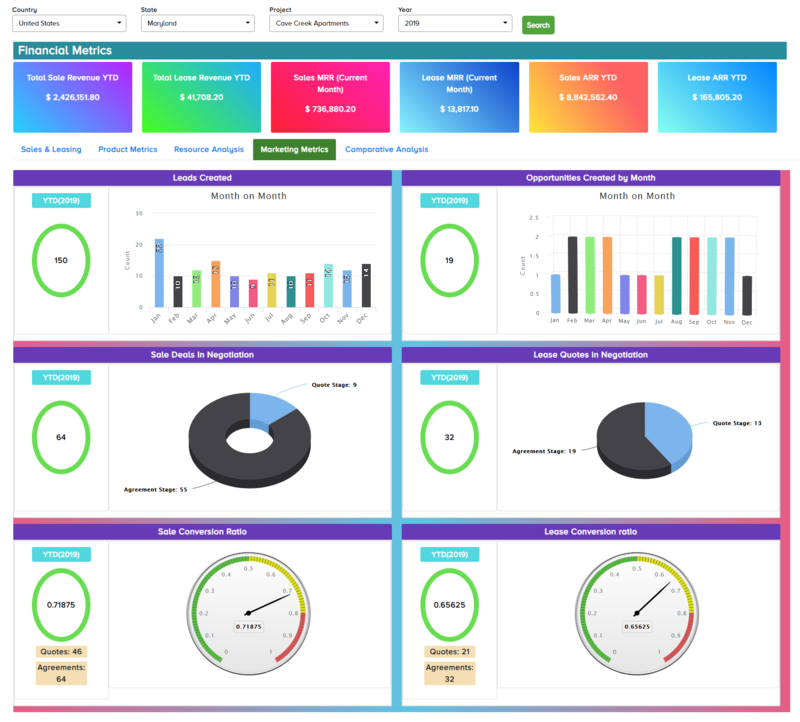 The app provides 360 degree view of your business via easily consumable reports and dashboards to help you visualise your performance for better decision-making. The app gives you a beautifully simple overview of your company. Know what you’ve been doing and see what’s next. Used by thousands of organisations worldwide, NetSuite's financial management solution expedites daily financial transactions, accelerates the financial close and ensures compliance. Our cloud-based single platform architecture ensures complete real-time visibility into the financial performance of the business from a consolidated level down to the individual transactions. 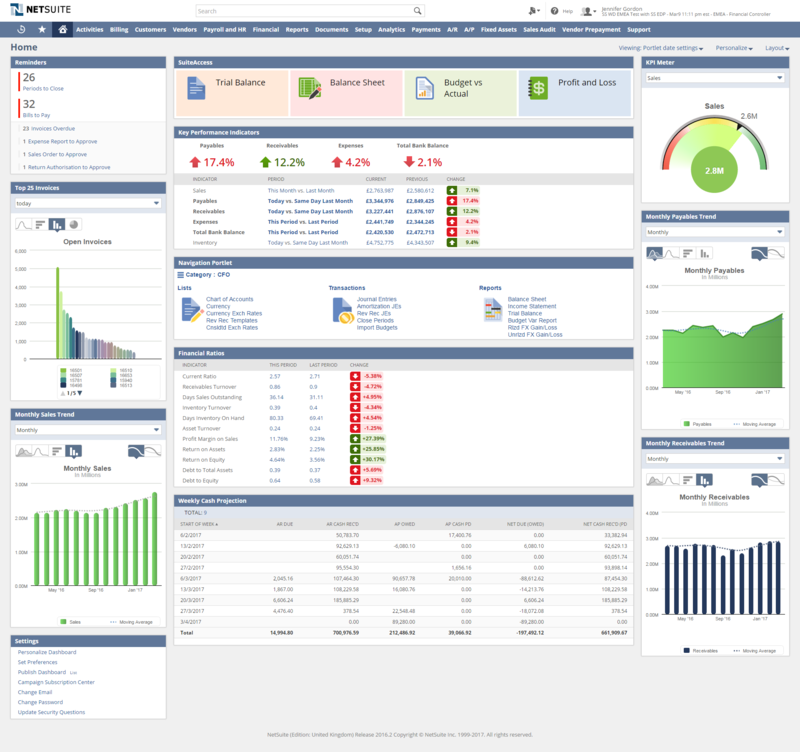 With NetSuite, your finance team gets more than automated and accurate financial statements. Your entire organisation gains a modern financial reporting experience that delivers real-time financial analysis across every dimension of your business for detailed insights into corporate performance and improved business decision making.